I was shocked the first time my second graders cheered when I told them we were going to take a reading test called the SRI. I asked them why they were cheering and found out that they had their eyes on certain books in my leveled classroom library and were dying for a chance to raise their score. I thought it was a fluke until it happened the next year. I’m amazed at the motivation to succeed that came from little level labels on books and an organized classroom library. I can’t share my library with you right now. Everything is boxed up in my new classroom. 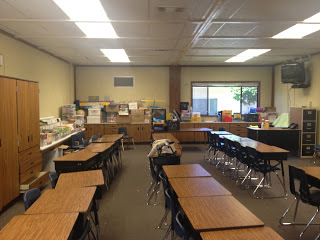 I did some pictures before leaving for the summer so I could try to envision my new classroom. You can see that I have clear bins full of books stacked on one counter. Each of those bins has a different level of books. I looked them up at lexile.com and then put labels on the outside. I found some labels that had 80 to a page. I also use them to put my name on everything. I put this editable file for free at my TPT store. I also thought I’d share a few forms I’ve used to keep track of my students reading progress. All of their reading scores on one page! This is so helpful for parent conferences or meetings about students that need extra interventions. The third form is a progress report my fantastic second grade team made. This helped parents know what tests the students were taking in reading, how their child did on the test, and what the on grade level goal is. I would write on the form. Then send a copy home. That way, when the next trimester came, I could add a new score next to the old one. This helped the parents see the progress their child had made. The form is in English and Spanish and editable.